Bragg, Thomas. Thomas Bragg Diary, 1861-1862, in the Southern Historical Collection of the University of North Carolina Library. Chapel Hill: Southern Historical Collections Library, University of North Carolina, 1966. Microfilm. 1 reel and guide. Cowper, Pulaski. 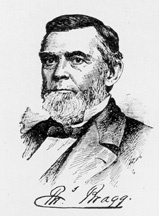 Thomas Bragg. In Lives of Distinguished North Carolinians, edited by William J. Peele, pp. 306-32. Raleigh: North Carolina Publishing Society, 1898.